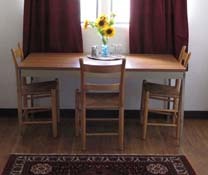 The Mandala Center is a quiet, intimate retreat center offering accommodations for up to 24 people in double room occupancy. The Casa Mandala offers spacious and comfortable rooms with large windows welcoming nature’s splendor. 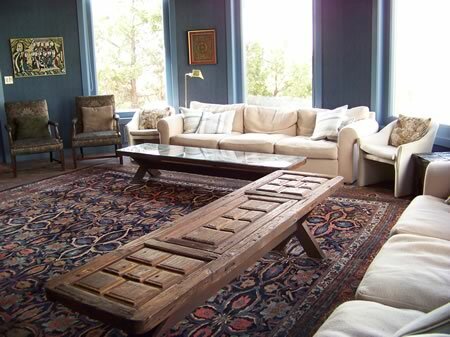 Decorated with a wide variety of heirloom furniture and art from around the world its curving walls mirror the slopes of Sierra Grande Mountain. This straw bale structure, completed in 1997, was added when it became clear thes “Center” was calling to the world and welcoming travelers, modern pilgrims, and seekers to its doors. 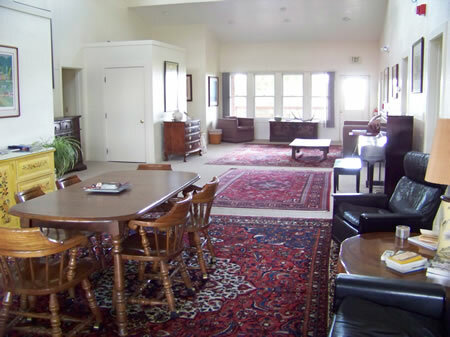 The Wolf Lodge is approximately 3,200 square feet and includes 8 guest rooms (double occupancy) and a large common area for meetings, relaxation, and fellowship. 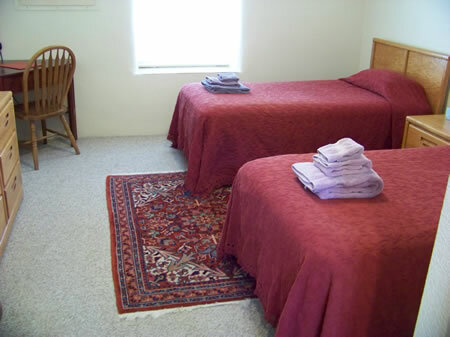 Each room has its own private bath and one bathroom is especially designed for handicapped accessibility. 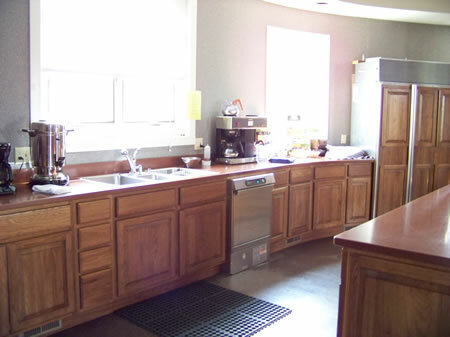 This lodge also includes a kitchenette for guests, particularly those on private individual retreat, to use for food preparation. There is a covered broad deck looking up to the peak of Sierra Grande and across the range to Capulin National Monument. Full capacity is 16 people. 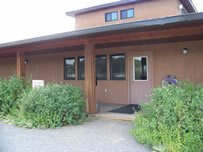 Next to the Casa Mandala is a smaller quieter structure that houses four double occupancy rooms and shared baths. 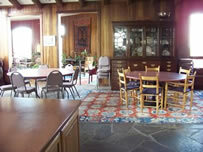 It is approximately 1,400 square feet with foyers but does not have a common area or kitchenette. The rooms serve as suites with a bath area between them. The bath area is divided allowing for the separate use of showers and toilet/sink areas. Full capacity is 8 people. 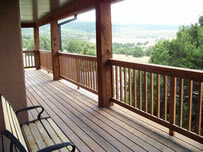 The Cowboy Cottage is a perfect space for private, individual retreats. Equipped with a full kitchen, this 2 bedroom casita provides a unique space for guests. 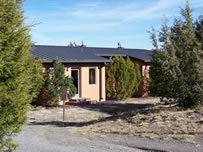 Located in the middle of a working ranch this rural setting offers respite from the stressors of everyday life. 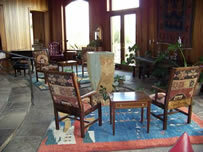 Enjoy the main Lodge during the day, relax in solitude at night. Stay for a day, a week, or a month. We offer special rates for longer stays. 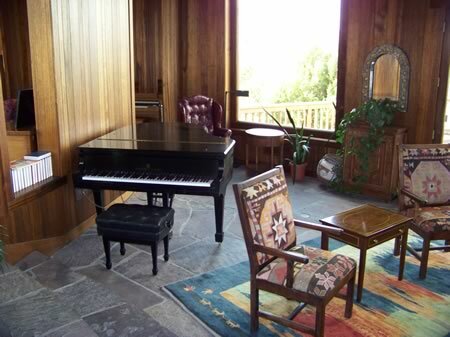 This space is available during limited times of the year. 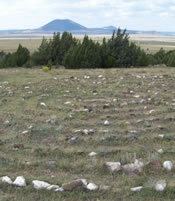 The labyrinth is a winding pathway, created in circuits, leading to a center. It is considered to be a spiritual tool that helps us to “center” ourselves. The labyrinth image has been in use in cultures around the world for thousands of years and is believed to represent a pilgrimage of sacred meaning. Our labyrinth is imaged after the Chartres design in the Chartres Cathedral in France, which was built around the year 1200AD. 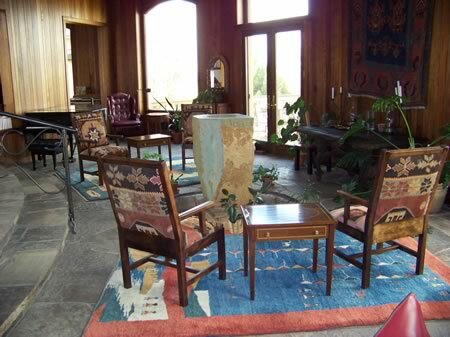 We offer this space for your use for prayer, meditation and inspiration. 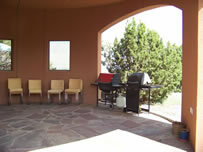 You can also view our Labyrinth on the Labyrinth Locator at www.labyrinthsociety.org. 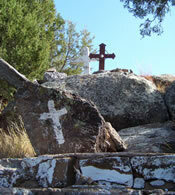 The historic outdoor Chapel of San Lorenzo, hidden among the junipers on the property, has been a place of pilgrimage for local gatherers over the years. The shrine was established more than 60 years ago by Jake Lujan and his wife Dolores in honor of his father Lorenzo Lujan and San Lorenzo. Jake was one of seven sons and his father passed away in 1937. Mass was held at the outdoor shrine as a tradition. 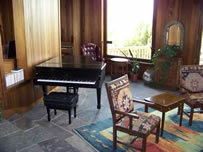 The Chapel provides an intriguing and soulful place for quiet reflection.